This is my second in a series of back to school posts. This time we're talking about packing school lunches. Many times I have found myself sending the same thing over and over again because I just don't know what else to send. I have seen things like this chart before, where you mix and match from various categories to create something. I have seen it for making smoothies, building sandwiches, creating a skillet dinner using ground meat as the base, creating meatloafs etc. I think I may have seen one to pack a lunch but I couldn't find it back. Anyway, I created this chart to print out and hang on the refrigerator. When you are planning your grocery shopping, pick a few items from each category for that week. You may want to prep and portion out your fruits and veggies ahead of time ... you may even want to portion out other items like crackers, nuts, etc. That way, when you are assembling the lunch, half of the work is already done. Click on the image below to enlarge and then right click to save and print. 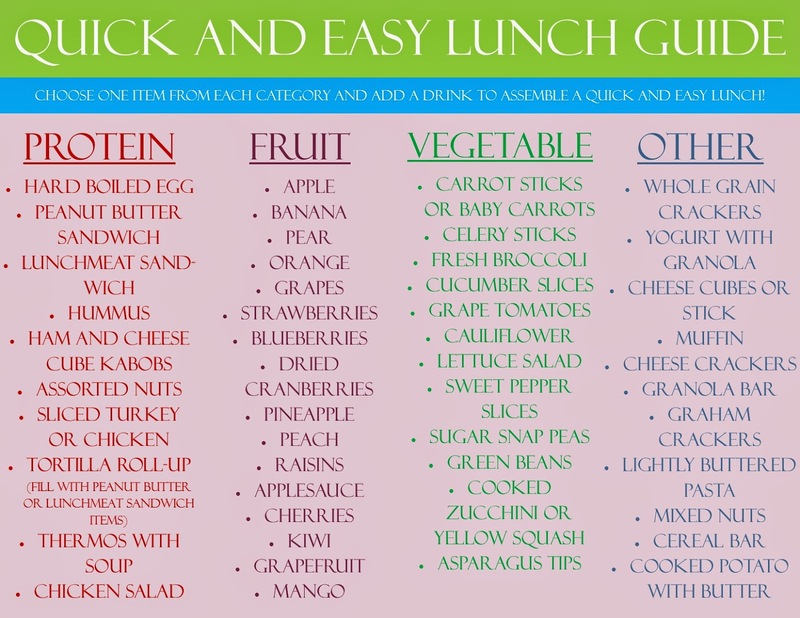 *Note: If you are unsure of any of the items on the list, I can tell you that at least one of my children will eat everything listed and the other will eat almost everything. Try it at home several times as part of your lunch or dinner. If they just DO NOT want to eat it, mark through it on the list and add items that are their favorites.